I have never met a caramel cake I didn’t like. Mostly, I think, because Betty Crocker has yet to throw her hat in the ring. That I know of, anyway. Caramel cake is a bit of a misnomer, seeing as the cake isn’t caramel at all. It’s the icing that’s caramel. Well, actually, even the icing isn’t caramel. It’s caramel-esque. And way better than any plastic-wrapped caramel you’ve ever encountered. 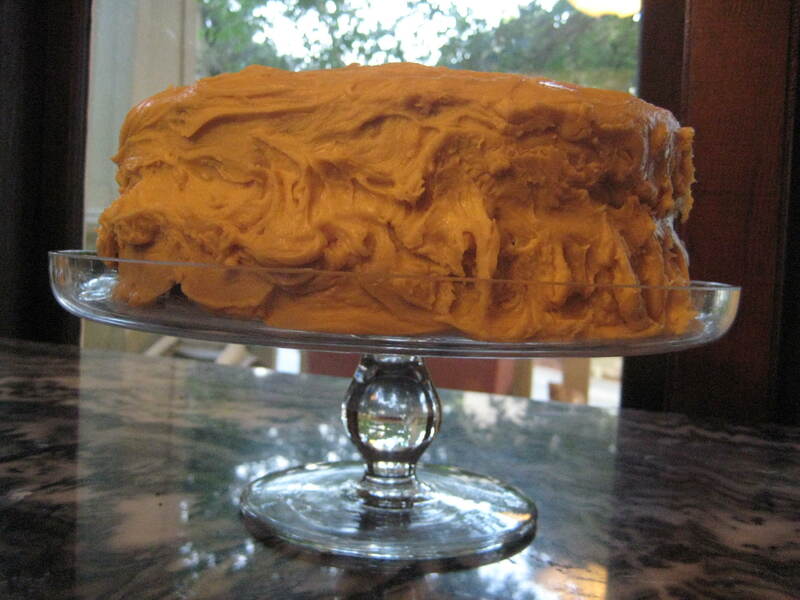 The first time I attempted a caramel cake, the icing turned out gritty. Did I still eat it? You bet. See “never met a caramel cake I didn’t like” above. The second time, I turned to the Patron Saint of Southern Cooking, Paula Deen. She did not disappoint. And, so, having mastered my technique, I decided to treat my sister to a home-baked caramel cake. What I didn’t plan on was my sister’s sad, sad baking pans. Perhaps I should have switched to sheet cake mode, but I was determined to wow my sister. And wow her I did. So the cakes stuck to the pans, but I ingeniously inverted them, crumbly side down. Which worked ok for the first layer. Halfway through icing the second layer, an avalanche sent one side of the cake sliding. Not to be defeated, I kept icing that sucker, which was getting crumblier by the second. Even my six-year-old nephew who loves to help in the kitchen decided it was hopeless and abandoned the project in favor of Sponge Bob. It wasn’t pretty, but that did not deter us from enjoying a slice. (Well, not so much a slice as a glob). But then, we’ve been known to eat my sister-in-law’s carrot cake rescued from a fall to the floor, which is a story for another time. 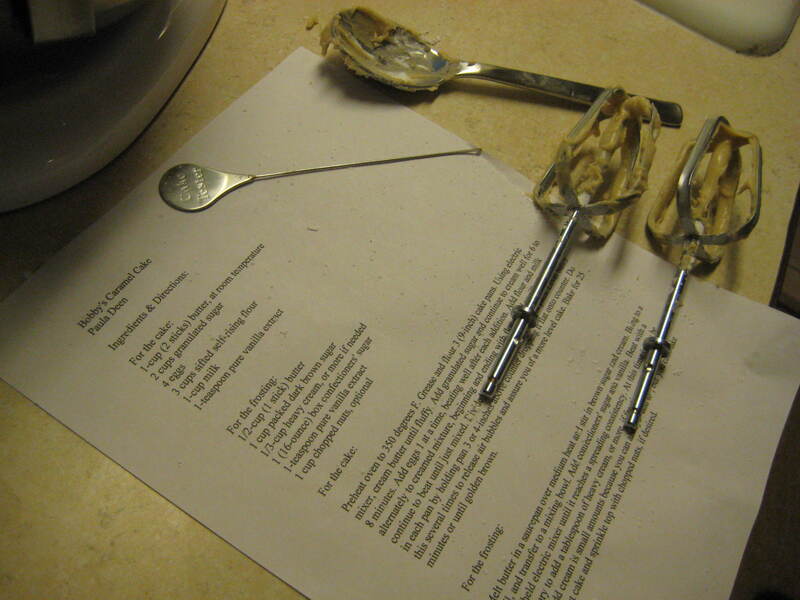 If you take a notion to make your own caramel cake, I recommend Paula Deen’s recipe. However, I leave out her layer of filling and have never missed those extra two sticks of butter and two cups of sugar. The icing isn’t a true caramel, but I’ve yet to figure out how that culinary feat is accomplished. I’ve tried many a time, but for me caramel always ends in disappointment or disaster. Anybody happen to have their grandmother’s caramel cake recipe? Please do share!! Oooooooh yum. I love the “stick it back together with frosting” method of reconstructing cakes. I have been nominated to make a caramel cake for the next potluck at work since one of my co-workers also read this blog. Will let you know how it goes. Oh, my Gah….I think I have found my twin-separated-at-birth-soul-sister! Yeth! *throws fist in air*…seriously. Well, darlin’, it does not matter if the cake is leaning like the famous tower in Italy, grab a spoon. Forks are for wimps. Grab a big ol’ serving spoon and get busy. ‘Specially if it’s caramel cake. Uh-huh.